Every time I go to Marché Jean-Talon, in Montréal, I come back home with a bit of inspiration. We had a short, but great holiday. We were able to see people we hadn’t seen in a long time, it was el kiddo’s first visit to the zoo and La Ronde, Montréal’s amusement park, and we spent quality time together. JB and I were able to enjoy grown-up time as well, and we had fabulous meals in some of Montréal’s finest restaurants. Back home, it was time to start cooking and this was the first dish I came up with. While I absolutely loved the combination of melon and prosciutto when I was in Italy, I have never found a ripe, sweet tasting melon proper enough to make and enjoy this combination in Canada. Why are Canadian melons so bland? Peaches and prosciutto are also a great match. Now, if you have never had lovage before, let me just warn you that the flavour is a bit intense. It has a very strong celery flavour, so if celery is not your thing, you may want to use basil or arugula instead, which would be nice here as well. If you prefer a milder celery flavour, use celery leaves instead of lovage. I really enjoyed the combination of these ingredients and this is a great summer dish. 1. Lay the prosciutto slices on a board or a nice plate, leaving a bit a space between them. 2. In a bowl, mix the peach slices, lovage and parsley and toss with the lemon juice and about 1 tablespoon of olive oil. Season to taste with salt and pepper. 3. 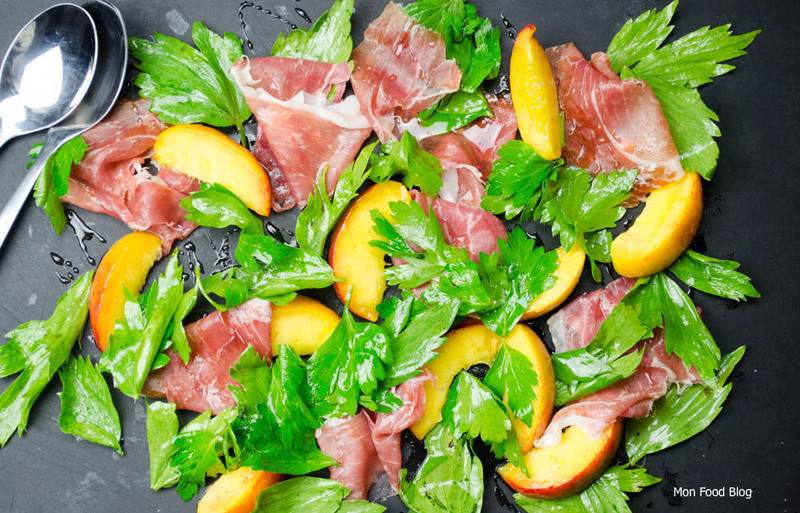 Place the peaches, lovage and parsley between the prosciutto slices and make it look pretty. 4. Drizzle with a bit more olive oil on top, along with a few drizzles of honey and a few grindings of black pepper and serve immediately.